For Peace of Bread Community Kitchen 2015 was another amazing year of giving & service. 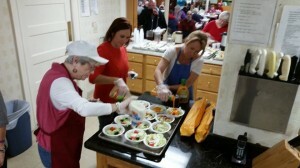 Through the generous donations of funds and food we were able to provide over 6,500 free dinners on Wednesday nights. Over 3,100+ volunteer hours were faithfully served. We also provided over 200 Summer Brunch Bags of kid friendly food to families with children during summer school vacation. Thousands of canned goods & food staples were donated to our food pantry and given away each week to folks in need of help feeding their families. The Northbridge schools & local Scout Troops work very hard running food drives to support our food pantry. The Free Clothing Room remains a weekly source of help with generously donated clean, gently used clothes, shoes & coats for all ages! One of the highlights of the year is our Free Christmas Shopping Night! 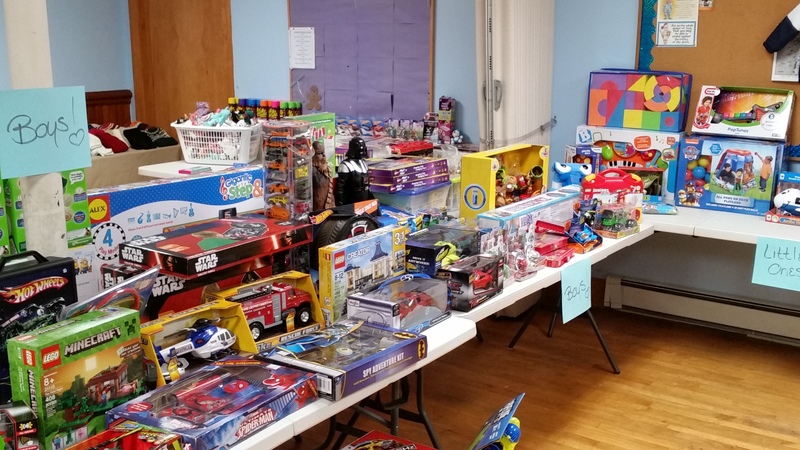 It was a huge success as always & a tremendous blessing to all the families with children who get to shop for new toys & all kinds of donated gifts. 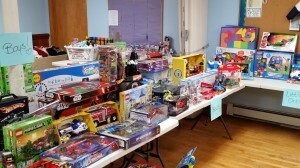 BJ’s donated most of the toys, but many individuals also donated toys & gifts. The Northbridge VBS donated their offering collection this year to PoB to help us purchase age appropriate gifts for the older kids who come to PoB. Twenty-nine beautiful, handmade Christmas dresses were donated by the Sewing Circle from the Blackstone Valley United Methodist Church. “Santa’s Elves” came & wrapped all the gifts for us too! It is an amazing night to say the least! We are so blessed by the Peace of Music ministry that continues to be a wonderful time of beautiful music, scriptures & prayer. Quite a few of the folks who come to Peace of Bread stop in for part or all of the service. Some of our volunteers pop upstairs when they can as well. It is such a wonderful atmosphere of sharing God’s love! Alternatives Unlimited has a sweet group of individuals & staff who provide crafts & games for the kiddos before dinner. Also new this year is our Bible Study at 4:30! We have a faithful small group who attend each week for a time of devotions, bible study, sharing & prayer. It’s incredible! We are beyond grateful to ALL who support our ministry efforts at Peace of Bread. So, so many unseen “angels” who pray, give sacrificially of time & talents & quietly serve the Lord in countless ways. There really are no adequate words to express what this ministry means to our community. For some this is the only contact with a church that they have in their lives. How great is it that WE here at UPCW get to open our doors, as well as our hearts, & share the love of God through our ministry at Peace of Bread? !